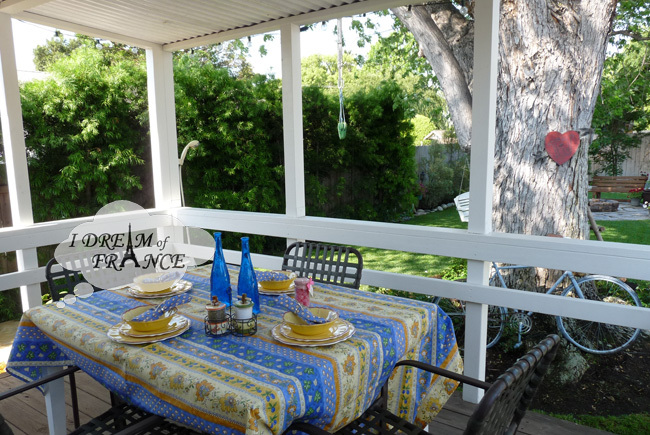 For the Old Town Tustin Promenade Home Tour, I decorated three tables in the garden of a charming bungalow. The family who lives here is laidback, sporty, and sweet. They spend a lot of time outdoors. It was fun to bring over some French decor for a day. Le Cluny Blue Monaco French Coated Tablecloth and napkins, Le Cadeaux melamine tableware, Eiffel tower napkin rings, L’Ami Provencal Raspberry Old Fashioned Candy, handpainted ceramic herb and salt mills with metal basket holder. 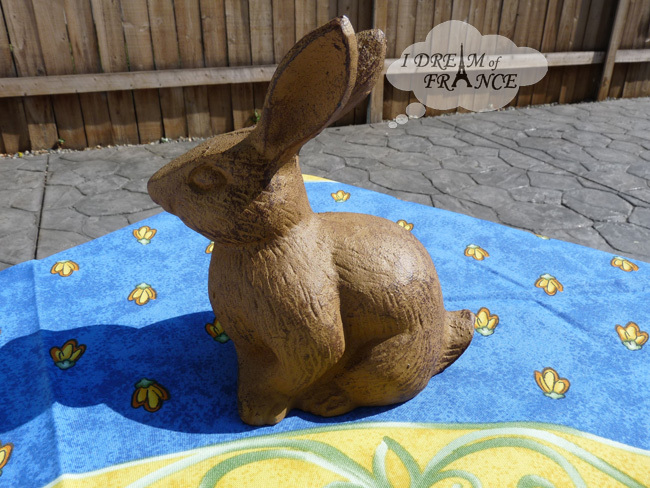 Cast iron bunny sculpture, Cicada Blue Provencal tablecloth. 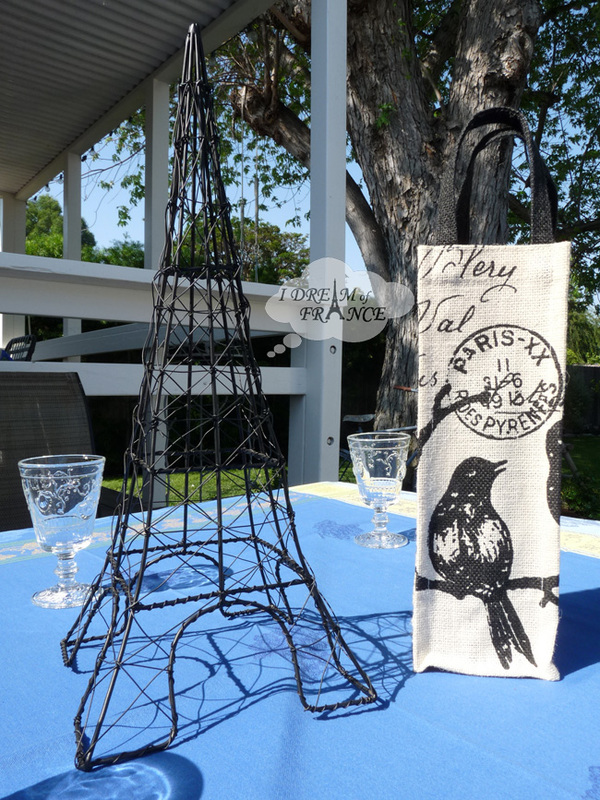 Le Cluny Travel Blue jacquard tablecloth, 18-inch Eiffel Tower, jute wine tote bag, La Rochere Versailles wine glasses. 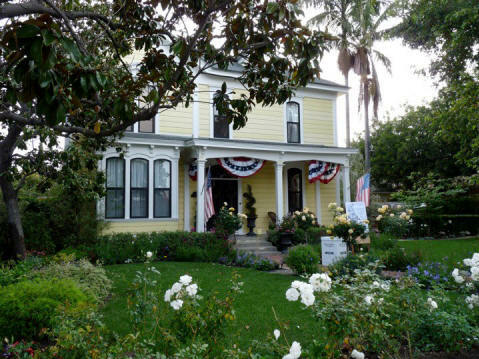 Are you going to the Villa Park Home Tour on April 28, or the Old Town Tustin Promenade on May 4? Look for I Dream of France and say Bonjour! I Dream of France will be decorating three tables at an historic home nestled in an orange grove. The home tour is on Sunday, April 28, from 12:00-5:00 p.m. Tickets are $40 in advance ($45 on the event day) and you can purchase them at The Green Pear boutique, The Flowery, or Villa Park Pharmacy in The Villa Park Shopping Center. Tickets include two drinks of your choice at the Post Tour Party being held outside between City Hall and Rockwell’s Restaurant starting at 4:00 p.m. You can also buy food wristbands for $10 (advance purchase only). Stock Your Pantry with French Food! Planning a holiday dinner? Thinking about hostess gifts? 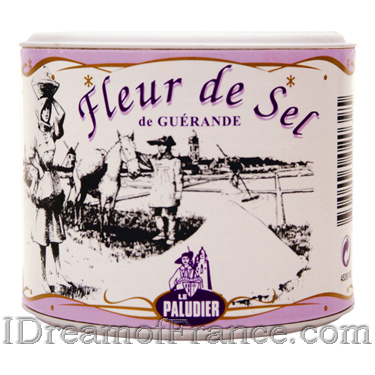 We just unpacked big boxes of French food items that will help you have a great time. Visitez I Dream of France to find more. As always, orders of $75 or more ship free! (Alaska and Hawaii pay $10 extra.) Don’t forget we ship to Canada! We can also ship to Australia and anywhere else worldwide. If you are outside of North America, just call us or send us an e-mail of what you want to order so we can figure the shipping for you. Below are some new items…more selection on our website and in our Old Town Tustin boutique! 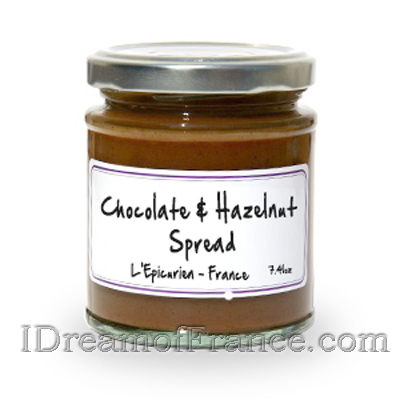 Tastier and healthier than Nutella, this Chocolate and Hazelnut Spread is perfect for an afternoon snack, sandwiches for the kids, breakfast pancakes, with ice cream, or for party amuse gueules. 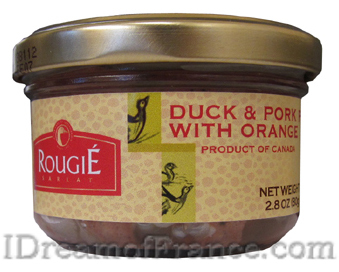 This Duck and Pork Paté with Orange is perfect as an appetizer, a snack or for parties. Enjoy the taste of central France with this traditional duck and pork paté on bread or crackers. See us in Orange Coast Magazine! See us in the November issue of Orange Coast Magazine! Look for the November 2012 issue of Orange Coast Magazine (with “Real Housewife” Gretchen Rossi on the cover). The Neighborhoods column on page 32 explores Old Town Tustin’s century-old storefronts and features some of the local businesses, including I Dream of France! There are a map and photos of the neighborhood, too. We are so delighted to be included! FREE trick or treating in Old Town Tustin on Halloween, this Wednesday! Put on costumes and come to our neighborhood after school from 3:00-5:00, and trick or treat with the restaurants and shops. Hundreds of people come every year. It’s a fun time to visit and people-watch. Marge Redmond Flamme at Old Town Flooring. Jean-Michel poses with Miss Bobbie at Miss Bobbie’s Low-Carb Shoppe. NEW this month and available in-store only! I Dream of France now offers France Today magazine. Written in English, France Today is full of articles about French travel, food & wine, culture, design, shopping, real estate and much more. Each issue also includes the TV5MONDE listings (US cable/satellite channel of French programming). We also offer Edible Orange County magazine for more articles about food, art, and Southern California culture. The Fall 2012 issue is all about chocolate! This is our third year of watching the Tiller Days parade go in front of our boutique in Old Town Tustin, and each year we love it a little more. It’s an old-fashioned, yet contemporary, slice of life in Southern California. The parade lasts about two hours and includes cheerleaders, dancers, and bands from the local high schools, as well as ROTC volunteers, Shriners, tractors, boy and girl scouts, local businesses and organizations, and horses. This post is picture-heavy. I wanted to capture it all! P.S. Want to see last year’s photos? Click here. Every year on Halloween, the merchants of Old Town Tustin pass out candy to trick-or-treaters after school hours, before it gets dark. This year there were about 400 kids and parents walking around. Top costumes included multiple Marios and a Luigi (who knew they were popular again? ), a family of nerds, Pebbles & Bam-Bam, princesses, and lions. In between clusters of kids, we snapped some photos. Scroll down to see all of them. As festivities wound down, we posed for photos with our neighbors. Here is Jean-Michel (a Frenchman dressed as a Frenchman, get it?) and Miss Bobbie as a witch in front of Miss Bobbie’s Low Carb Shoppe & Cafe. Here is Marge Redmond Flamme in front of Old Town Flooring. Does the broom give her costume away? Here I am, in front of I Dream of France, dressed as…the American wife of a Frenchman!